A new painting – for my first Galway city host, the caricaturist Allan Cavanagh. Yes, I’m still working on the paintings that were started on the painting tour and then carried around the country unfinished. This was mostly painted on site in Galway. With my end-of-year painting sale now almost out of the way, I expect to finish fairly quickly now the outstanding dozen or so paintings started on the #paintingtour (so long as my health holds this time). I’ll add any more articles or posts, should they appear. There is now a gallery for all the paintings done on the 12-week Painting Tour. Some paintings started on the tour are still being completed. I’m adding them to the gallery as I finish them. The painting tour is now over but here are weekly summaries, of the routes, the photos, the paintings, and the words, as compiled and blogged by my brother on his blog. Stay tuned for more paintings, photographs, and words on the painting tour which I’ll be posting over the coming days and weeks now that the tour is over. A quick note. I am blogging, but haven’t published any posts yet while I’m getting to grips with a new machine and a new way of doing things. But I will. Photos of just the completed paintings can be seen here. Also if you look closely at this website you will notice a thingamajig on the right hand side. It displays short updates by me from the trip, most often made from the road on the bike. You can also see those updates on twitter under the #paintingtour hashtag. If you keep an eye on that tag you will also see chat and updates (such as photos) on the trip by other people including people who have hosted me. There are also photos on my camera proper and my tablet which I’ll be posting somewhere soon. 6 paintings have been completed, including one commission which I did on day 1, and 5 paintings for hosts. I’ve cycled in Dublin, Kildare, Wicklow, Carlow, Kilkenny, Carlow again, Wicklow again, and Wexford. Sketches and journal notes are also going into a sketchbook. I’ll probably show you a page or 2 at some point. 5 recordings on AudioBoo were made but 4 of them didn’t just not upload – they didn’t save. I haven’t given up though, as recording on the bike especially is just too much fun not to keep trying. Today I’m cycling down the Wexford coast. It is, at the time of writing (6 a.m.), the 1st day of the trip so far that I do not have a host for. That’s fine. I may stop somewhere, paint a picture, then try to sell it via Twitter and Facebook to fund a B&B and dinner. Next counties on the list are Waterford, Cork, Kerry, Limerick, Clare, and Tipp. How and when I fit Laois and Offaly in will dictate schedule for Galway, Mayo, and Sligo. In short the first 10 days have been tremendous. The people who have hosted me have all been brilliant (making it hard for me to move on) and every single cycling day has included staggering beauty. Honestly (I’ve thought about it). Time to pack. I’m cycling in an hour. I’ll just have this pot of tea first. Six years ago I bought a FreeRadical with freeloaders and wideloaders. I was living in car-centric Kansas City, and Xtracycle changed my life. I quickly told people that the FreeRad was the best thing I ever bought. Four years ago I moved home – to Ireland – with my XtraCycle. I work for myself as an artist, a painter. There is no canvas, no frame, no entire art show, that my xtracycle has been unable to carry. In 1992 I did a solo cycle through 10 countries from Ireland to Turkey. In 1996 I did a solo cycle through 24 US States from Boston to San Diego. I wish my bike had been XtraCycled back when I did those and other long-distance tours. I posted a gallery the other day of 24 photos of my XtraCycle carrying various loads. A national newspaper saw it (Irish Independent) and interviewed me for a feature on cargo/utility bikes. I know of 2 cases in Ireland who have bought XtraCycles based on my witterings on Twitter and my blog. Six years of heavy use, American Midwest weather, and Irish rain, have taken their toll. It’s a long time since anybody could read my snapdeck or called it a skateboard. I still routinely tell people that XtraCycle is the greatest thing I ever bought. Because it still is. 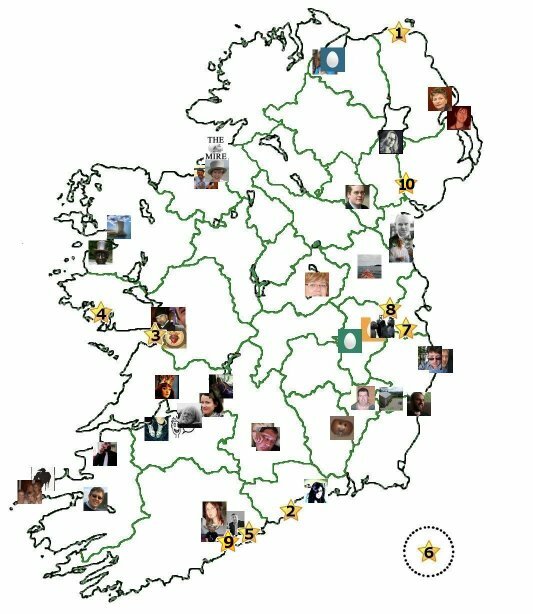 In July and August, 2011, I am planning to cycle around Ireland, all of the historic 32 counties, painting as I go, with the route determined by social media – where people volunteer to host me in return for one of those paintings. This is also where I’ll blog the trip including, if I can manage it, some audio and video clips. I’ll continue to use my regular account on twitter to tweet the trip and, I imagine, my regular account on Facebook to neglect it. Photos will appear in a variety of places depending on whether they are taken by my little phone (picplz, twitpic) or my camera proper (flickr, pix.ie). And so verbose am I that there may even be a book – or at least I plan to capture enough words for one. Roughly, the route will go from Dublin clockwise around the island back to Dublin, but as the 32 counties are not lined up in a convenient circle the route will involve some serious zigging and some frivolous zagging. I expect to have a significant number of hosts before the trip starts so will have a reasonable idea of the general route come Friday, July 1st, but I also expect to be soliciting hosts as I cycle and the sun is setting which will pretty much finalise the route. Apart from hosting, people can also get paintings and be involved by helping me prepare. This trip has been conceived and planned without me having a penny, but there are a few things I need for the trip (e.g. a tablet, a mifi, dry bags, tyres) – so I’ll be posting details of how people can commission me to cycle to any spot on the island in order to do a painting for them, in return for €75 paid in advance to facilitate equipping me for the trip. While the trip is not being done specifically for charity, I will be auctioning a painting from the trip for Shine and making it possible for people to donate to Shine as I cycle. As of June 29, there are about 43 people who have volunteered to host in exchange for me doing a painting in their locale. 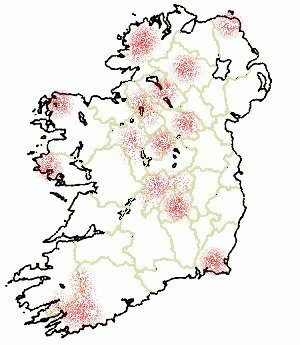 This map highlights the areas of the country where currently there are still vacancies for hosting. Given that the route around the island is generally clockwise, the greatest need would be in the areas planned to visit earliest – southern half of Wexford. in week 1; west Cork and east/south Kerry in week 3, and maybe Laois and Offaly in weeks that I haven’t decided yet where they fit. I should stress that there is no great need to have hosts ageed for everywhere before I set off (on Friday, July 1st) as a major characteristic of the trip is envisaged as seeking hosts from the road – or to give it its scientific name, making it up as I go along. The map is also not absolute, in that there there will be room for hosts in some areas not shaded red e.g. west Clare, south Derry, south Armagh, and glamorous parts of Kerry. Also at any time new commissions received can create a need to go to a part of the country where I don’t currently have a host, and later the route significantly. A look at the white spaces on the latest map of hosts should give a more precise idea of where hosts may be needed.